The 2010 draft may go down as one of the better drafts in Blue Jays history and, unsurprisingly, it was Anthopolous' first at the helm. The Blue Jays had 11 picks in the first 5 rounds, and managed to successfully sign all 11 players. 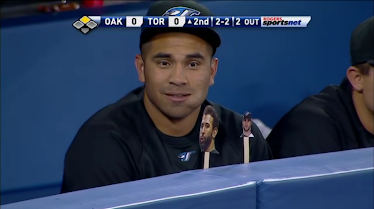 Three of those players -- McGuire, Sanchez, and Wojciechowski, made my Blue Jays Top 15 prospects list, while another (Marcus Knecht) has gained a lot of national publicity due to his Canadian roots. Despite being drafted early (38th and 80th overall respectively), Noah Syndergaard and Justin Nicolino have flown under the prospect radar. Both players signed for around $600,000 USD, which is roughly slot for Syndergaard, but overslot for Nicolino. With MLB's useless policy of holding back overslot deal in an attempt to lower the market, Syndergaard was able to debut in late 2010, while Nicolino missed an opportunity to pitch in his new organization. The right handed Syndergaard was seen by many as a safety pick, after Toronto's first two draft picks were used on Deck McGuire and Aaron Sanchez, both of whom were known to be seeking overslot money. Given that he is a high school pitcher I'm not sure how anyone could consider him a "safe" pick, but regardless the Blue Jays were happy to see him fall into their laps at 38, and even happier that he signed early and was able to get on the field. 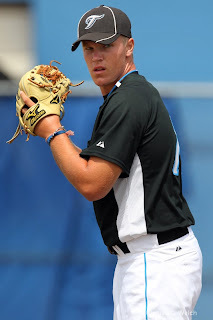 Despite signing early, Syndergaard made only 5 starts (13.1 IP) for the Blue Jays Gulf Coast affilate in an effort to control his workload in his first year with the organization. Noah is a big kid, standing 6 foot 5 and weighing 200 lbs. With such a long, lean frame, it is believed that as he matures he will be capable of adding muscle mass and could see a spike in fastball velocity. He throws his 4-seamer in the low 90's, but is already capable of touching 94-95 mph. As he is in such a transitional phase physically, it's fun to speculate that he could see his fastball start sitting 92-94 mph and touching 96-97 mph a few years down the road, but, at the same time, pitching prospects are so unpredictable that it's just as possible his fastball has capped out at above average. In addition to his 4-seamer, he throws a decent curveball that has shown plus potential. Strong coaching could really making it a great pitch. As with most highschool arms, Syndergaard worked primarily with those two pitches, but has also worked in a mediocre changeup that is a work in progress. He hasn't shown a ton of feel for it yet, so it would be difficult to give it anything above average potential. Syndergaard is mentally strong as well, as entering his draft year he was considered a "pop-up prospect" -- a potential draftee who shot up draft charts in the spring. His agent mentioned in an interview with Jays Journal that the improvements which resulted in his draft stock skyrocketing were through hard work and an outstanding work ethic on Noah's part. In his first full season with the Blue Jays, Syndergaard has split the year between Bluefield (Rookie League) and Vancouver (Short season Low-A). He has posted strong numbers, giving up only 32 hits and 7 earned runs in 41 innings. Just as impressively, he has struck out 49 batters and walked only 14. These numbers translate to a 1.54 ERA, 1.12 WHIP, 3.50 K/BB, 10.76 K/9, and .211 BAA -- all of which are outstanding. Despite being their 7th selection, the left handed Nicolino was taken in the 2nd round and, much like Syndergaard, was overshadowed by the bigger names in the top of Toronto's draft. 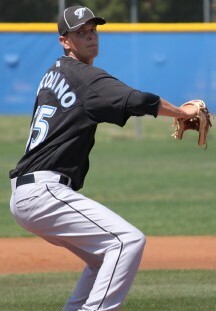 As the 4th highschool pitcher drafted by the Blue Jays in 2010, Nicolino was a continuation of General Manager Alex Anthopolous' apparent goal of targeting high upside talent, regardless of the risk involved. As mentioned, Nicolino's overslot signing bonus was held back by Bud Selig and the Commissioners Office, making 2010 a lost year professionally. Unlike Syndergaard, Justin Nicolino has an extremely wirey frame, standing 6 foot 3 and weighing only 160 lbs. Shockingly, that weight is a dramatic improvement upon his weight of 145 lbs in his highschool years, during which he he had trouble sitting in the mid 80's. Now slightly heavier, Nicholino works his fastball between 88 and 92 mph, and has the ability to paint the bottom corners. Nicolino features two offspeed pitches -- a high 70's changeup and a low 70's curveball. Unlike many highschool pitchers, Nicolino throws both offspeed pitches frequently, which is likely a big factor in his early professional success. His arm action is a little inconsistent between his fastball and changeup, but the delivery is relatively smooth for a pitcher of his age and development stage. Nicolino's greatest strengths may be his command and pitching IQ, both of which he developed while working with a below average repetoire. As his arsenal continues to improve while he matures physically, those tools should further accentuate his pure stuff, and may allow him to pitch above his natural ability. Nicolino was assigned to short season Low-A, and he has been nothing short of dominant. In his 45 innings of work, he has allowed only 23 hits and 6 earned runs. He has walked 11, and struck out an outstanding 58 -- good for a 1.20 ERA, 0.76 WHIP, 5.27 K/BB, 11.60 K/9, and .151 BAA. These numbers are not floated simply by a strong outing or two either, Nicolino has been consistently dominant. In 6 of his 10 games, he allowed 1 or fewer hits. In 8 of his 10 starts, he allowed 1 or fewer walks. In 7 of his 10 starters, he struck out 5 batters or more (which is particularly impressive given his game limit of 5 innings per start). All of this translates into one of the most dominant stretches by any pitcher in the Blue Jays farm system in recent memory. While both pitchers are years away from sniffing the Toronto rotation, they are most certainly two arms who deserve more attention than they have been getting. Toronto's prospect rankings are going to see a dramatic facelift entering 2012 due to promotions (Lawrie, Drabek, Arencibia), trades (Stewart), struggles (Perez, Wojciechowski) and surges (d'Arnaud, Alvarez, Marisnick, Hutchison, etc), which could allow prospects like Syndergaard and Nicolino to sneak into the 2012 top 15 and truly make a name for themselves.